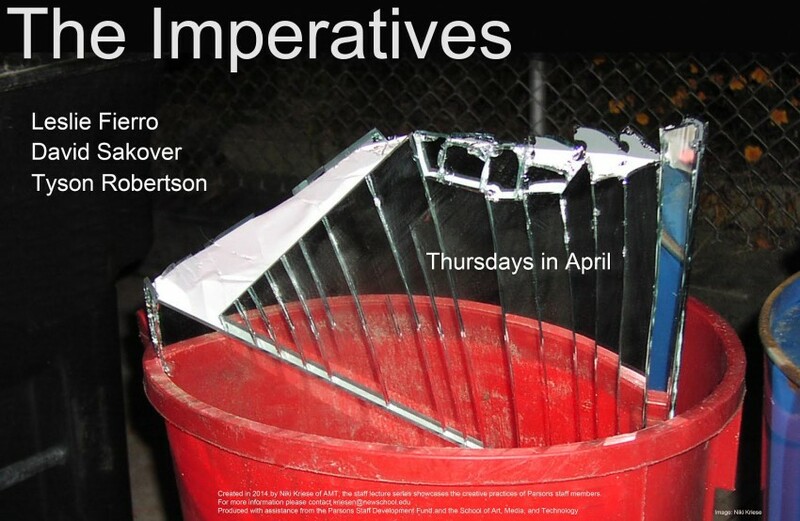 Organized by Niki Kriese of AMT, the staff lecture series showcases the creative practices of Parsons staff members. This year’s series looks at those reaching outside their main disciplines, forging connections with areas that may often go overlooked. There is an urgency to these conversations, one of inventing a new ways of speaking, but also racing to preserve an old language before it goes extinct. These artists often incorporate other people in their work, who may be used as subject matter, guinea pig, idea generator, but often these others can be seen as stand ins for the artists themselves. Through film, text, interactive performance, and all kinds of experimentation, the artists approach their topics from different directions but share that same need to tell their story, disguised as someone else’s. For more information please contact kriesen@newschool.edu. Produced with assistance from the Parsons Staff Development Fund and the School of Art, Media, and Technology.